The right repair parts aren’t going to help you much if you don’t have the proper tools to install them. At Equiparts, we have all the tools you need for repairing your Sloan flushometers and other flush valve brands. The tools needed to repair Sloan flush valves are described in detail below. They are also shown in the diagram above to help you identify which tool(s) you need to help you repair all of the different areas of a flushometer. Utilize the flushometer repair picture above to find out which flush valve tools you need to complete your necessary repairs. 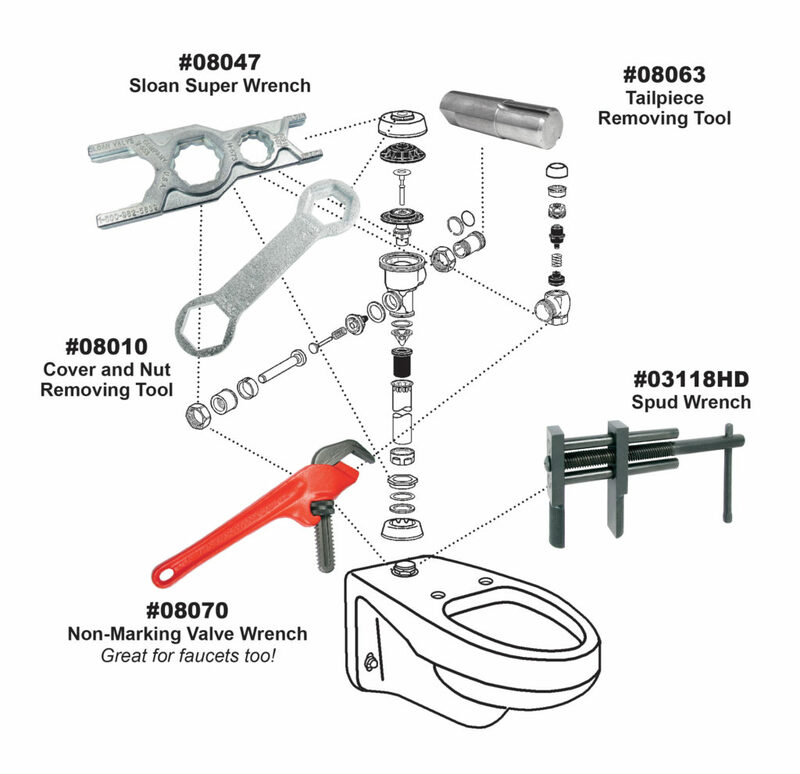 Read on below to learn more about each flushometer repair tool in the diagram. 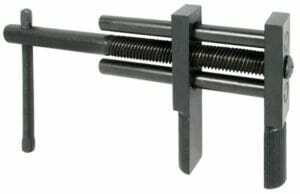 This wrench can be used on every exposed nut and hex on any Sloan flush valve. Each area of the Sloan Super Wrench is marked with the Sloan OEM number of the part of the flushometer the tool is meant to fix. It can also be used on Zurn and Toto flush valves too. View the Sloan Super Wrench in our online store. This tool allows you to, (you guessed it,) remove nuts and covers from Sloan flush valves. It provides a different grip from the Sloan Super Wrench, and can give you more leverage, depending on the situation. 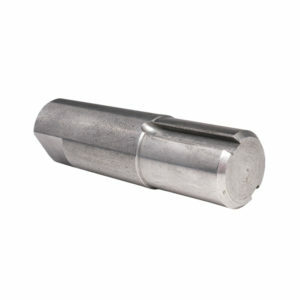 View the Cover and Nut Removing Tool on our website. This wrench can do everything the Sloan Super Wrench can, and more! Since it’s adjustable, it can be used in a large variety of plumbing repairs. 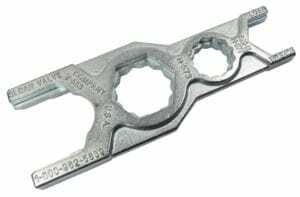 The non-marking feature allows you to use this wrench on units with chrome plating or other specialty finishes without damaging the finish. The offset design helps you access awkward spaces with ease. Use on flush valves, faucets, fittings, tubular, etc. See the Non-Marking Offset Adjustable Pipe Wrench product listing. This is an absolute MUST HAVE if you need to remove tailpieces from a Sloan flush valve. Sometimes when you’re upgrading a urinal, you need to change the rough-in from the standard 2-3/16″ in order to make it fit, and so the tailpiece needs to be removed. Attempting this with a pipe wrench or any other tool can be a nightmare. The Tailpiece Removing Tool will save you a ton of effort and frustration. It works internally which prevents marring of the chrome. Do yourself a favor and pick one of these up today. View the Tailpiece Remover Tool on our website. Yes, this tool does just that – removes spuds. This heavy-duty tool is rugged and adjustable, and works for most any spud. Makes removal simple! View the Spud Wrench in our online store. Work with Equiparts to get these handy tools as well as the repair parts needed to service your flushometers. Place your order by giving us a call toll-free at 800-442-6622 Mon-Fri 7:30am-5pm EST or submit a quote through Equiparts.net and we will contact you to complete your order. Download or Share the Flushometer Tool Diagram PDF with other facility maintenance professionals, plumbers, or other professionals who perform maintenance or repairs on flush valves and help others find the tools they need easily and quickly by utilizing our plumbing tool picture.